I hope your morning has been a smidge better than mine (although really I shouldn't complain because I'm sitting on the couch in my pj's at 11am while The Rose is napping drinking a coffee. Last year this day would have been a DREAM). It's a sick day for us in our household. Combine that with making a grocery list (Monday routine) and it makes me want to just chuck everything out the window. [Side note: You know when you feel sick and you don't really feel like drinking coffee but you're like, "I have to drink coffee! I've been waiting the last 20 hours for this and if I don't I won't get to drink coffee again until tomorrow morning!" and so you drink coffee anyway and know you're going to regret it later? That's me right now]. Just pray for me. That's all. Anyway, on Friday I told you I would share and update of our home. And I'm going to be honest. I was hoping I'd get around to a lot more decorating over the weekend than I did. I kind of want to cringe at the thought of sharing my house photos only one week into the move, because they're not very "pinteresty" if you know what I mean. But oh well. This is the real life and here is my real house update. Bare with me and don't judge! We've made most progress with the kitchen. As far as we know ALL the kitchen boxes have been unpacked. I am still getting used to putting things in their places, but it's in proper working kitchen mode at this point. 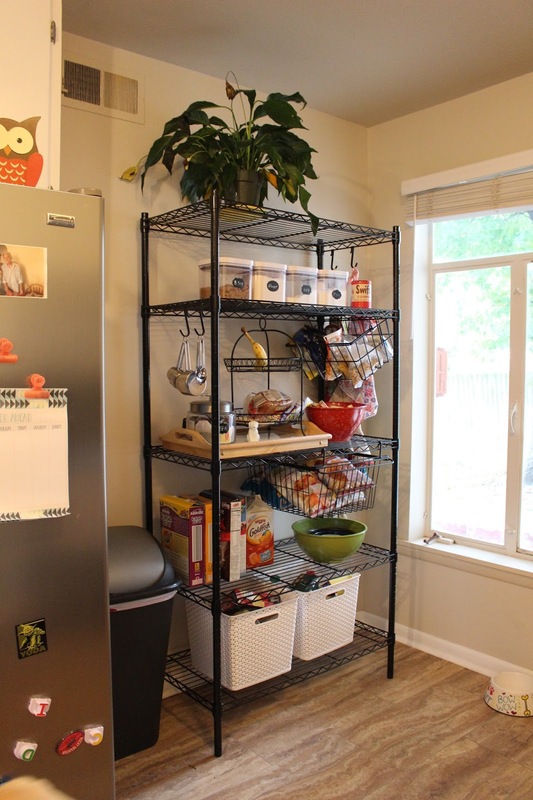 We bought this handy storage rack over the weekend for our kitchen. What we really wanted was a nice kitchen island (kind of like this) that could serve as a pantry and counter space, but number one: it wasn't really in the budget, and number two: we are renting and don't know what our future kitchen (when we buy) will look like and if we will want something like that. So, we opted to get this multi-purpose storage rack. It works great for kitchen needs now and down the road can serve well in a garage or laundry room. What's super cool too is we bought some of the accessories that went along with it for organizing purposes, and I really like it! Other than the kitchen, we've been spending most of our time on the living room and dining room. We've made a lot of progress, but when I look at photos like this it doesn't really feel like it. So far we have unpacked about 50 boxes, set up both our bed and our guest bed, along with The Rose's crib. We've hung curtains in most rooms but the guest bedroom. We've thrown some things up in the attic for long-term storage. We've mostly finished organizing our closets. (Poor Mr. Christopher has to put all his clothes in the guest room). We also made sure to hang The Rose's swing in the tree in the front yard. (Priorities, people). There are definitely some things we are still working on this week. We're waiting on a few purchases to come in the mail (an IKEA desk, two rugs and some small home organizing pieces). Once we get those things set in place we start hanging things on the walls and making the place feel more at home. Later this week or next I plan to share some packing and unpacking tips since I feel like a pro-mover these days. Some of you have already shared, but if you haven't please share your favorite packing or unpacking tips in the comments below! I'd love to use your helpful tip on my post!